I’m not sure why my Food & Wine ran a recipe for Escarole with Pickled Butternut Squash back in July. Of course, I only had a chance to read the magazine this past September, but I made a mental note to make the salad once the produce became available. (For the record, I am current with my Ladies Home Journal subscription; how to pose my cat for optimal cuteness? Tell me more!) So when a butternut squash, so large it towered over my cat came in the CSA last week, I thought it was time to make the salad. But I still had to find the escarole. I walked to the Copley’s Farmers’ Market during my lunch break last Friday and chatted about the recipe with every farmer there. “I’m not sure why the magazine printed this recipe in July,” I would say to each as I explained my search for escarole. The last farmer scoffed, “You’re not sure why they printed the recipe in July? 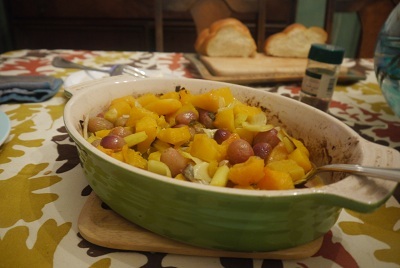 Well, I’m not sure why they’d write a recipe with produce that doesn’t grow at the same time!” It turns out the escarole will come once the butternut squash have all been roasted and eaten. Deterred but not defeated, I regrouped. I still desperately wanted to make this salad. 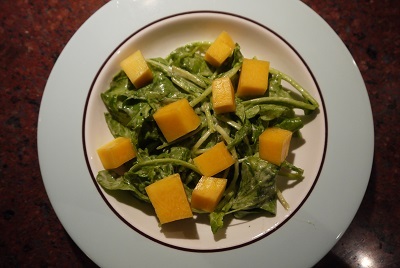 And then it occurred to me, why not use the arugula that came in the CSA alongside the butternut squash? The peppery bite of the dark lettuce would be strong like the escarole. Although I was still a little concerned about how the creamy dressing would cling to the sharp leaves, I pressed onward. Well, it turns out that arugula makes a great substitute. Apparently this recipe is from all-star chef Gabriel Rucker, featured in the magazine in 2007. Sounds like a reservation at his Portland, Oregon restaurant Le Pigeon is the toughest one in town to make, but not as hard it is to find escarole at a farmers’ market in October, since that is apparently impossible. 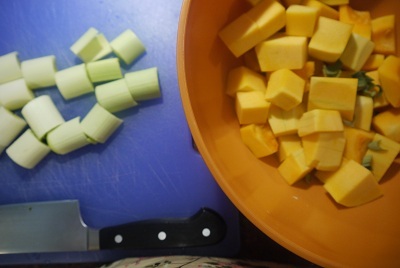 It’s a quick pickle for the squash, and I loved the crunch and twang against the creamy, herbal dressing. For the arugula, I soaked the quarter pound that came in the CSA in three rounds of cold water. I used a quarter pound because that’s what I had on hand. For the record, I think the dressing would spread well with a half-pound of arugula, so let’s call that two bunches. I also pickled a cup’s worth of squash, rather than the half-cup the original recipe called for. Just to have for munching. In a large bowl, toss the arugula with the sage dressing. Arrange the greens on plates, top with the pickled squash and serve. Make Ahead: The pickled squash and garlicky sage dressing can be refrigerated for up to 2 days. I’ve always thought of herbs as seasonal. Basil and mint are summer herbs, while rosemary and sage are more wintery. Of course, the sage bush in front of my house, which flourishes in the summer sun, upends my theory. Many summer nights I would run from my kitchen, apron still tied around my waist, to pluck a few leaves off for dishes like sautéed cabbage and white bean dip. Nonetheless, the sage bush was still hanging on well into January. There were still some thin, curled leaves clinging to life until last week. But with snow forecast, I knew that would be the last of my sage until late spring. I grabbed the last remaining leaves on Thursday night and stowed them away in the fridge. I must confess that Rich helped me a great deal with the baking this morning: My herniated disc has been slowing my kitchen production to an almost stand-still. 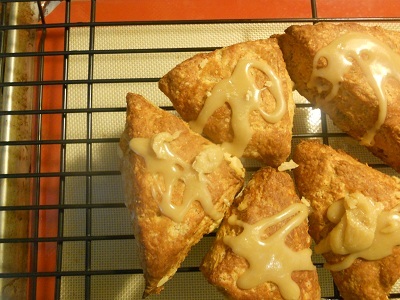 Rich had the wise idea to make eight scones instead of the four the recipe suggested. 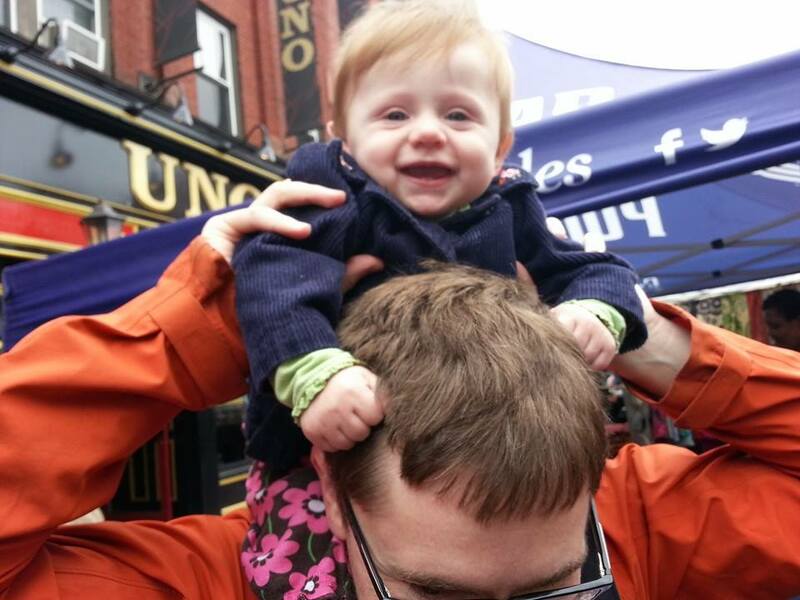 A mini version of the cookie proved much less of an irritant to my reflux. Although the original recipe calls for full fat Greek yogurt, we used a low-fat version, something that I now keep in the house as a mild snack for me. And we loved the grated frozen butter tip; we will definitely be utilizing that trick in other baked goods. The scones were glorious, rich and extraordinarily delicious. A wonderful way to begin a Sunday morning. And one last thing: If you could ask four questions of the Boston Globe‘s advice columnist, Meredith Goldstein, what would they be? Here are my four questions. 1 stick frozen butter, of which you will use 4 Tbs. 4. Mix together flours, sugar, baking powder, baking soda, salt and sage. 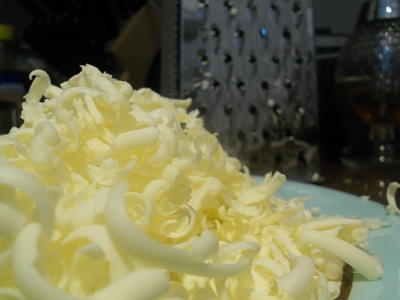 Add frozen grated butter and toss until butter is well-coated. Gently stir in milk mixture with a spatula just to combine. 5. 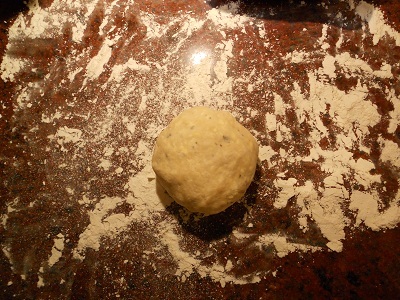 Place onto floured bench and knead a few times until it comes together. Gently press into a 1/4″ thick square, then fold up long sides in thirds (like folding a letter) then fold up short sides until you have a small tall square. 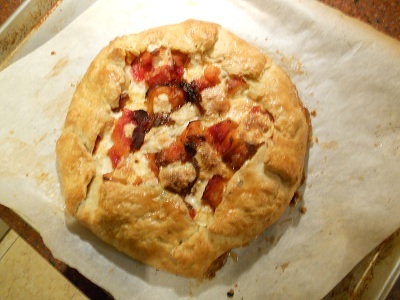 Place in freezer for five minutes on a floured plate. 6. Place on floured bench and gently fold or roll into 1/4″ thick square. 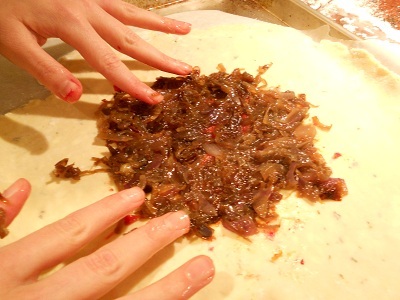 Place enough walnuts to generously cover the surface, then press walnuts into the dough so they stick. 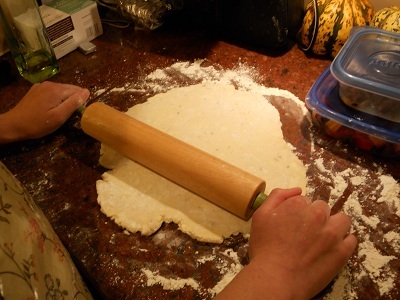 Gently roll dough into a log. With seam facing down, press into rectangle — it will be about 6×4 and an inch thick. Using floured knife, cut in half then cut each half into triangles. 7. Place on silicone lined (or parchment paper) baking sheet. Bake 18 — 20 minutes until browned. Let cool. 8. 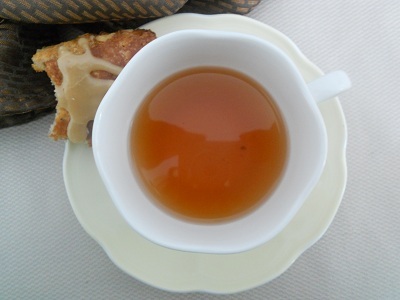 Make the glaze: Melt butter in small saucepan and lightly brown, add maple syrup. It will bubble vigorously. Once bubbles have subsided, whisk in confectioner’s sugar, add enough milk or cream to thin glaze slight (until it looks ‘spreadable’). Drizzle or brush over scones. *Note: If you end up with a thick glaze, just spread on with a spatula and call it icing, no one will be the wiser. Well, it’s finally October, which means some of the best foods of the whole year – butternut squash, beets, arugula, cauliflower and, wait for it, pumpkins – have started to appear at markets and in CSA boxes around town. Two weeks ago, my weekly CSA list noted an inclusion of a sugar pumpkin, which meant I was this close to fulfilling my stuffed pumpkin dream. When I arrived at the student union for my usual Thursday pick up, there was a new girl checking off names. It was obvious there was no pumpkin in my box, and, even more frustrating, there was an enormous pile of sugar pumpkins on display right next to her. Rather than putting her on the spot, I thanked her for my pumpkinless box and brought it back to my office. Naturally, the only thing to do was call the farm and see how I could go about getting my rightful pumpkin at the next week’s pickup. They were totally cool about it; apparently I was the only person who either did not get their promised pumpkin – or who was crazy enough to actually call them about it. “There’s a pumpkin shortage this year!” I tried to explain to Rich. Well, this week I received my promised pumpkin, as well as a new pumpkin in my box. 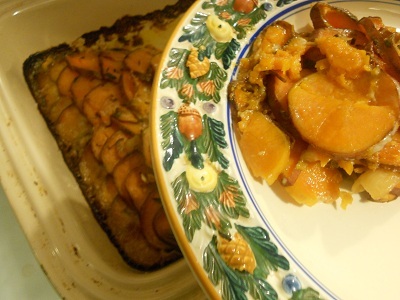 So now, I can either make this dish twice, or use the second one for a terrific pumpkin pudding recipe I stumbled upon last year around this time. Friday night we finally had the pumpkin of my dreams. 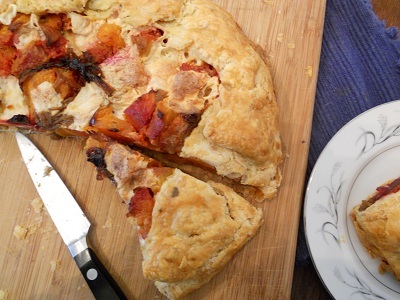 It was everything I hoped it would be: the perfect combination of softened sweet squash mixed with the savory notes of the cheese, cream and sage. It may have been one of the best things I’ve ever eaten, and I eat a lot. 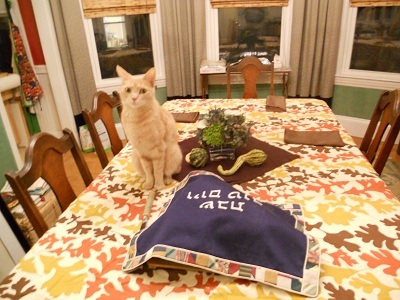 Our dinner guest thought the pumpkin tasted like pumpkin pizza, minus the sauce. 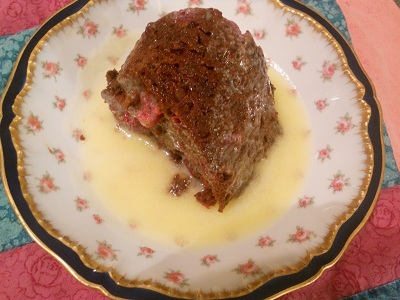 He suggested rather than me choosing between making this recipe a second time or making the pumpkin pudding, that I should go and find more pumpkins and make this again and again. Like I said: Off. The. Chain. Given the cost of the Gruyère, I wouldn’t break the bank on a good one. Trader Joe’s carries reasonably priced cheeses. We’re not really big wine drinkers; lucky for us, the liquor store now carries teensy little bottles of wine. Mine cost $1.99, and I am pretty sure I can get three more pumpkins out of it. My point is: don’t break out the good stuff for this dish. We’re lucky enough to have a sage bush growing in front of our house; please feel free to stop by and pluck some leaves if that’s the only thing stopping you from making this dish. I think I’m a little late to the Melissa Clark fan club, as she has written and co-written dozens of cookbooks. In the Kitchen is how I imagine a good cookbook to be: excellent writing and tales followed by superb recipes. I had this book for less than five hours when I decided that we needed to have the baked flounder and eggs for dinner that night. Clark actually suggests it as a breakfast, which sounds amazing to me. And I’ve made her green goddess dressing three days in a row. She has a new book out this week, and I cannot wait to get my hands on it. • Preheat oven to 425. Cut the baguette slices in half lengthwise and place on a baking sheet. Bake until golden brown, 5 to 7 minutes. • In a medium saucepan, bring the cream, wine, milk, garlic, and sage to a boil over medium heat. 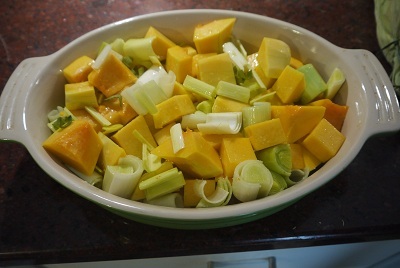 Reduce the heat to low and allow to simmer for 5 minutes. 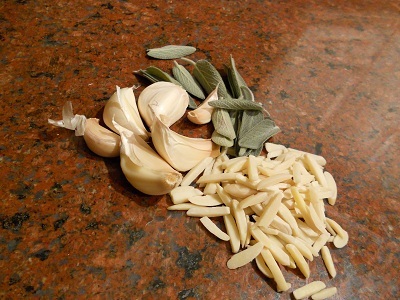 Take the mixture off the heat and discard the garlic and sage. Stir in ½ teaspoon of salt, the nutmeg, and the pepper. 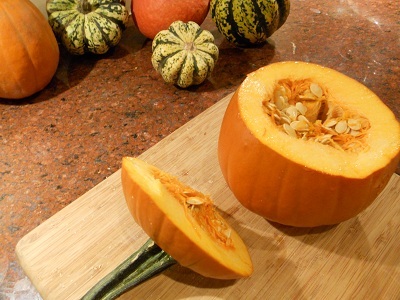 • Cut the top off the pumpkin and scoop out the pulp and seeds. (If you want to toast your own pumpkin seeds, and I always do, see the Note below.) 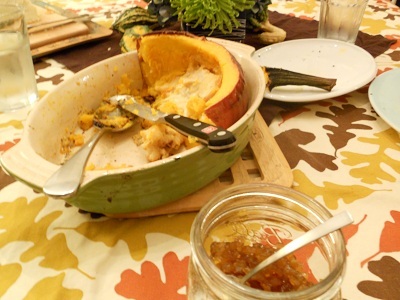 Set the pumpkin in a baking dish. 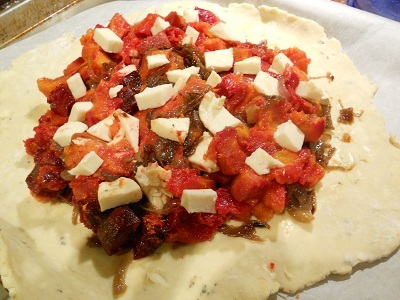 Place a layer of bread in the bottom, followed by a layer of the cheese. Poor in a third of the cream mixture. 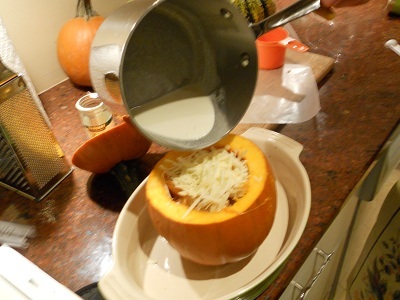 Repeat for 2 more layers and replace the pumpkin lid. Using your fingers, rub the oil all over the outside of the pumpkin and sprinkle on additional salt. 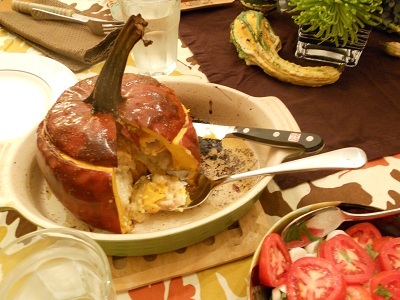 • Bake the pumpkin until the skin blisters and the flesh is fork-tender, about 1 ¼ hours. 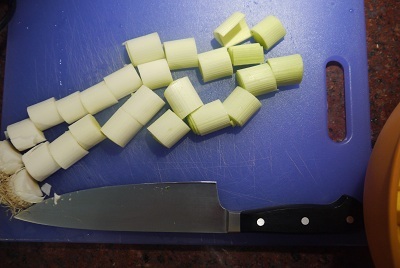 Allow to cool in the pan slightly, then slice to serve. 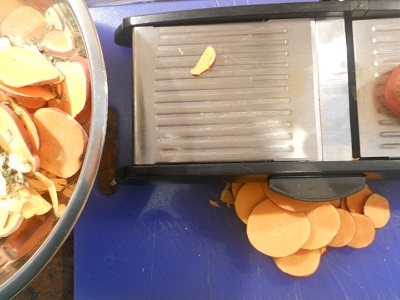 NOTE: I saw this method for toasting squash seeds on Jody Adams and her husband’s new blog The Garum Factory. Like everything Jody does involving food, it’s pretty much perfect. BONUS TOASTED PUMPKIN SEEDS RECIPE FROM THE GARUM FACTORY: Put the mass of pumpkin pulp and seeds in a large bowl and fill it three-quarters full with water. 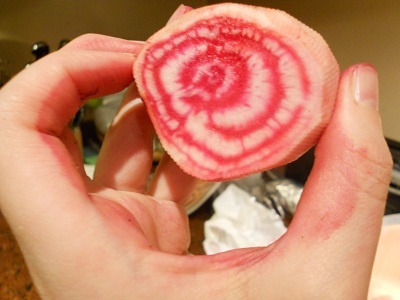 Work the pulp with your fingers to release the seeds from the fibers. The seeds will float. Skim the seeds and spread them on a sheet pan. Bake in the oven for 3-4 minutes or until dry. Remove the tray from the oven, drizzle a Tablespoon of oil over them, then season with salt, smoked paprika and a pinch of sugar. 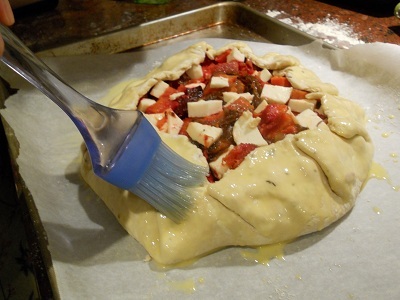 Smear everything about, then return the pan to the oven. Roast until the seeds are golden brown and crisp, about 8 more minutes. Use as a garnish, or eat like popcorn with a great beer. This past December, my friend Rachel and her roommate hosted a small Chanukah dinner party at their apartment. They roasted a chicken, fried latkes, tossed together a salad of mesclun and goat cheese. And then there were the green beans. I must admit that until this point in my life, most of the green beans almondine I’d had were by way of Bird’s Eye: out of the freezer, into microwave. The foil-wrapped almonds don’t usually make it into the toaster oven and are treated as an optional addition at the table. 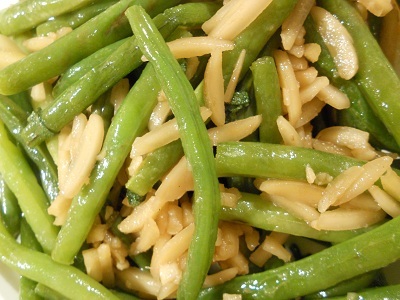 But the green beans almondine at this Chanukah party, wow! 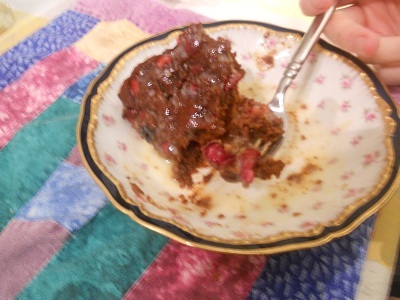 I may have had two servings of them, then I may have loitered in the kitchen until it was decided that there weren’t quite enough left over to dig around for a small Tupperware. 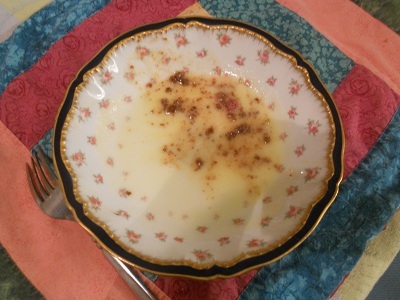 And then maybe, just maybe, I greedily ate the rest of the beans and golden almonds directly from the serving dish. 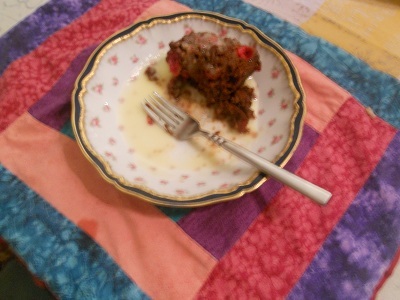 I can’t quite remember if I used a fork for that final mini-serving, or just gobbled them up with my fingers. There are a few things working together for this dish. 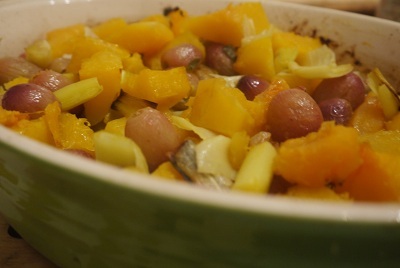 One, I think, is to toast the almonds in the saute pan at the beginning and all the way through the making of the dish, rather than separately in a toaster oven or small pan. The second is the mix of butter and olive oil. I’ve actually tried this dish with a bit more butter, making it two tablespoons or so, and it was too buttery. (No, really, there can be such a thing.) Definitely stick with just a tablespoon of each fat. And there’s the fresh sage, a small but impactful last-minute addition that really ties the beans, nuts and garlic altogether. Finally, and please don’t cringe when I say this, remember to salt liberally every step of the way. The nuts get a little salty because of it, but the beans are just right, and let’s face it: salty nuts are delicious. I happened to have both green beans and sage in the house this week. The slivered almonds I always have on hand; I store them in the freezer to keep them from spoiling. Melt butter in a saute pan that has a lid on a medium heat. When melted, add the olive oil; it should take no more than 20 seconds for them to make friends. 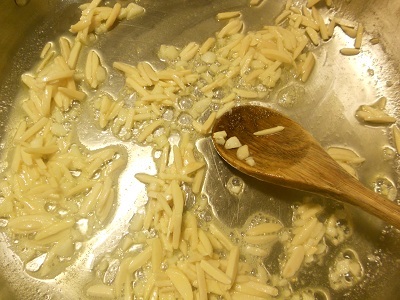 Add the garlic, almonds and a pinch of salt to the melted butter and oil. 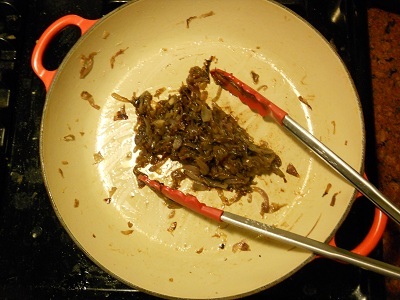 Stir everything together for about a minute and a half, but make sure your garlic doesn’t brown. You might want to turn the flame down a little bit to make sure that doesn’t happen. Add the green beans and a pinch of salt. Stir everything together for another minute. Add about 3/4 cup of water, lower heat to medium low and cover pan with lid. It should take about 20 minutes for the green beans to soften. They will no longer be the bright green they turned when you added the water, but shouldn’t look too dulled, either. About 10 minutes in, do a quality-control bite. Most likely you’ll add another pinch of salt to continue to draw out the beans’ flavor. The nuts will have turned a bit more golden. There should be enough water to steam them the rest of the way, but if you’re scared they’re going to burn, add a few more tablespoons of water. Recover pan. About 10 minutes later, do another check. Chances are the beans will be cooked all the way through. Taste them again. Do they need more salt? If the beans are now soft, stir in the fresh sage and let everything cook together for about two minutes more. If the beans aren’t yet soft enough, cover the lid and cook them for about five minutes or until soft, taste, then add the sage. Try not to eat too many with your fingers as you cook them.